Eurus Energy America Corporation is pleased to announce the completion of its second wind farm in the State of Oregon. 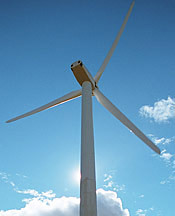 Construction was completed in late December 2009 with energy sales commencing on January 1, 2010 under a 20-year power purchase agreement with Clark County’s Public Utility District Number 1. The project is sited on 13,000 acres of farmland near Milton-Freewater in Umatilla County. The project utilizes 63 units of Mitsubishi MWT-62/1.0 turbines each rated at 1 MW. This is Eurus Energy America’s ninth project in the United States, bringing its gross installed capacity in the United States to just under 590 MW. The project is expected to produce enough electricity to power approximately 11,000 homes, displacing over 115,000 tons of carbon dioxide emissions annually. Blattner Energy acted as Balance of Plant contractor and the Bonneville Power Administration is providing interconnection and transmission service. “We are very pleased to be playing a role along with the local community, County, State and Federal Government in helping the world move away from its over-reliance on fossil fuels and thank all who have played a part in making this project a reality,” said Mark E. Anderson, President and CEO of Eurus Energy.